There are so many crowd sourced projects out there. How do you decide which ones to back? Now I have an answer for you. You should back this Kickstarter for The Greatest Toy Kit in the Universe! Spider Tank Mark 6. 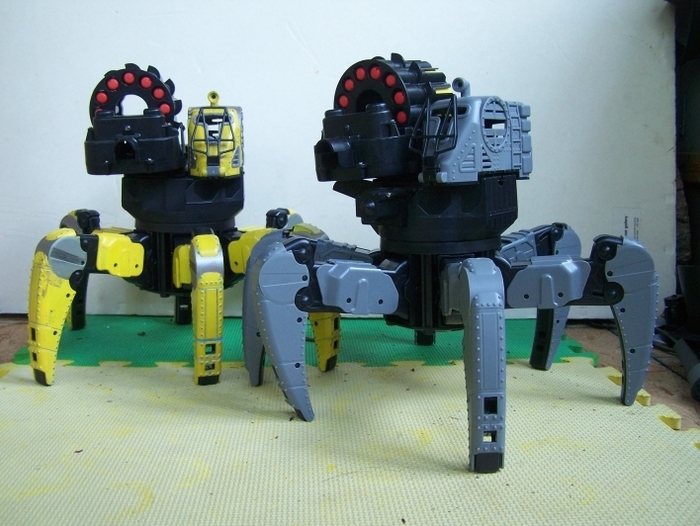 The reason you should back it is this… I need a spider tank robot, and this is the best way for me to get one. OK, OK, maybe you need more motivation. For that, let me introduce the creator of this kit, Jaimie Mantzel. Jaimie is a bit of a mad creative genius. He lives on a mountain in Vermont, in a geodesic dome he designed and built. There’s no road to his home, except the one he cleared himself, which is barely passable. 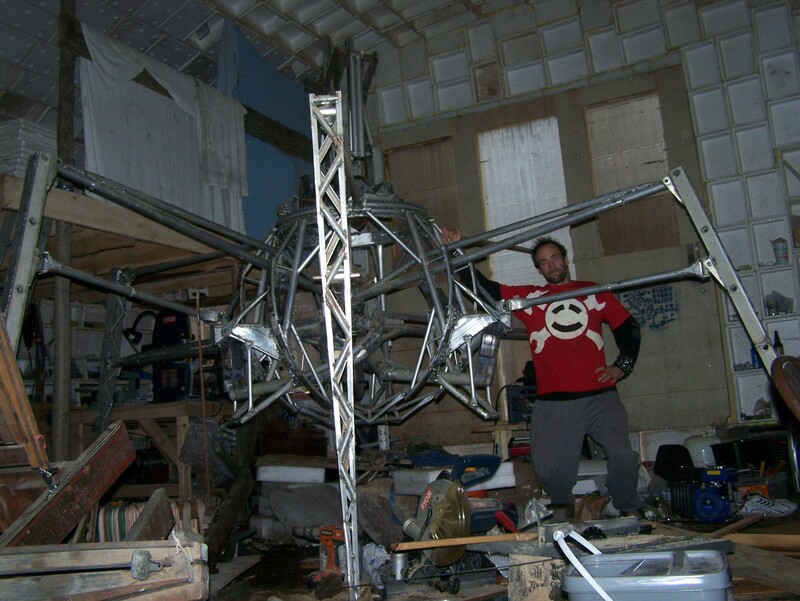 He bought a surplus aircraft hangar, hauled it up to his mountain in pieces, and reassembled it there for a workshop to build his giant six-legged robot. You can learn a lot more about Jaimie on his You Tube Channel. A couple of years ago, he teamed up with Wow Stuff, a U.K. toy company, to produce a small version of his giant robot he called the ‘Spider Tank’ (despite having only six legs). They now sell this toy under the brand name Combat Creatures, but it is not available in the U.S. yet. I’ve been eagerly awaiting the availability of this thing for years, and now I have my chance. Jaimie launched a Kickstarter on July 15th. If he can reach his goal, the toy company he works with has agreed to produce the kits. However, they need an order of 5,000 of them to be worth the effort. It’s a pretty ambitious goal. I talked with Jaimie on the phone as he was hiking through the woods, carrying his two young daughters strapped to him. So, who is this kit for? “I imagine it is for people like me… people with experience building things and who want something cool to make. People who like making and inventing things. Experienced builders will be able to really see how the mechanisms work. “They are super hackable. That was one of the important things when I was designing it. I like to take things apart and modify them and stuff. Even if you aren’t into electronics, everything is modular. So you could pull things apart and change things. There are two ports that haven’t been used by the toy company yet. They could be used to override the electronics and use an Arduino or Raspberry Pi to control the robot, instead of using remote control. I didn’t design the electronics, but I worked really hard to be sure this sort of thing was possible. What was it like working with Wow Stuff? It’s really cool working with a smaller toy company. I can talk to the CEO… it’s easy to make things happen, without a big corporation getting in the way. What’s different between the Wow Stuff toy and the Spider Tank kit? “The basic robot chassis is exactly the same, but you get to put it together yourself. I’ll have instructional videos to help make that easy. The accessories are the same too. The armor for the kit is different. I always envisioned the robots as vehicles. The toy company sees them as a pet creature or something and markets them like that. I don’t think that is as fun as robots you can pretend to get in and drive around. So the armor for the kits is more like a mech warrior. I’m also going to try to put in some tips in the instructions, like little tweaks that will enhance performance. Why should someone back your project? “Well of course because you get a really cool thing, and a fun experience putting it together. You’ll get a custom experience that few others will have. Also, this is supporting something that really is not available, generally speaking. Toy companies are not producing more intelligent toys. Maybe if this goes really well toys companies will see that there really is a market for toys that don’t market to the lowest common denominator. We’ll keep our eyes open for news about the Giant Robot. That sounds like a party to be at. In the meantime, I encourage you to check out Jaimie’s Kickstater and maybe snag one of these awesome robots for yourself or your favorite kid or lovable geek. Lots of people are buying two, so they can fight each other. If the fundraising is successful, the kits should be available in December, right in time for the holidays. Editorial Note: It turns out Kickstarter’s rules currently prevent Jaimie from offering more than one kit per backer. Jaimie will provide an update if he’s able to convince them to allow it, but they rarely make exceptions. Not convinced yet? See Jaimie explain why his project is worthwhile in his own way. Also, there’s a chance Jaimie will come to World Maker Faire in New York. We’ll hope to see you there too.